Have you ever wondered when looking into a German dictionary why there is (v.t.) or (v.i.) behind the verb? 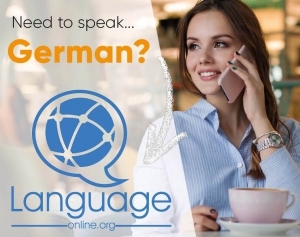 Well, language-easy.org will help you to solve this mystery of German grammar! So, (v.t.) stand for German transitive verb and (v.i.) stands for German intransitive verb. But… what are these types of verbs? Although you might think that this is just a marginal topic in German grammar – be aware! Of course, you have to master these verbs in order to speak and write in a perfect way. So, in the following, I’d like to clear up what these type of verbs actually are and we will also have a look at a group of verbs that can be both – German transitive and intransitive verbs. By the way, in this article on Wikipedia you can find some additional information about this type of German verbs. And, of course, some interesting background information about German grammar. Well, let’s come to our first topic of this article and talk about the German transitive verbs. Los geht’s! 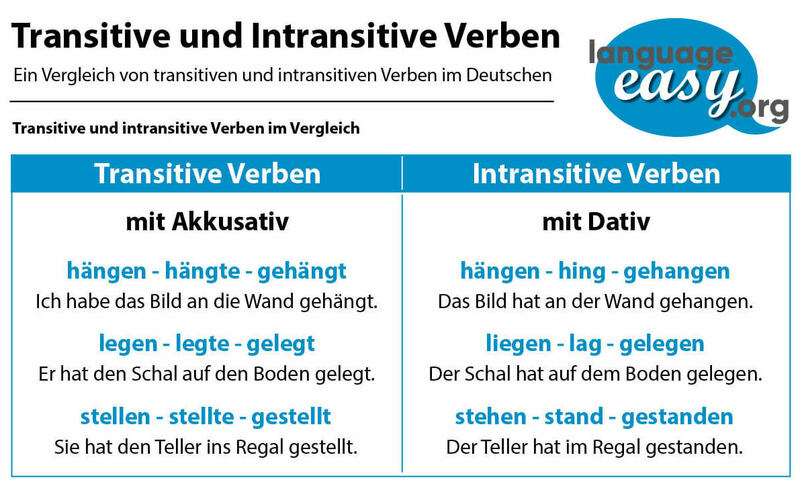 So, let’s come to the first point of this article and talk about German transitive verbs. Luckily, most of the verbs in German are transitive. So, transitive verbs are verbs that take an object e.g. a noun, phrase or pronoun. They take the accusative case. Well, here are some examples that illustrate what is meant by this description. So, I think these are the most important facts about this type of German verb. Now, let’s come to the next point of this article and talk about German intransitive verbs. Well, German intransitive verbs do not appear that frequently in the German language. Nevertheless, you should try to master them anyway – it will definitely help you to understand grammatical construction and, of course, improve your speaking skills a lot. So, the great difference between intransitive and transitive verbs is that this type will always take the genitive or dative case, whereas transitive verbs only take the accusative. German intransitive verbs are verbs used without an accusative object. Apart from that, you should be aware that this type of German verbs can not be used in the passive voice. Well, the only exception to this rule is when you’re using the pronoun “es” in special circumstances. And, by the way, reflexive verbs are also intransitive. So, there also exist verbs that can be either transitive or intransitive, depending on their meaning. In the following, you will see some examples for these type of verbs. Well, a few verbs have varying conjugation forms depending on whether they’re being used as transitive or intransitive verbs. So, we use the regular forms for transitive verbs. In the following, we will have a look at the verb “hängen” (to hang). Who/What did I hang on the wall? And, we use the irregular forms for intransitive verbs. Well, let me illustrate that by the following examples. Das Bildhat an der Wand gehangen. Who/what was hanging on the wall?